“We make it clear that we have no objection to a civilian terminus in Advance Landing Grounds ( ALGs ) situated in Arunachal Pradesh. It is upon the state government, the Airport Authority of India (AAI) and the Directorate General of Civil Aviation (DGCA) to decide how to go about it. This was informed by IAF Chief of Eastern Air Command, Air Marshal C Hari Kumar in a meeting with Chief minister Pema Khandu today. Actually the one of the major queries raised by the state government in the meeting was on use of the ALGs for civilian purposes, Air Marshal Kumar informed that the IAF has absolutely no objection to it. In fact, he said, IAF will be more than happy to see civilian aircrafts land on these ALGs. Establishment and operationalization of civilian terminus and passenger/commercial flights is at their sole discretion,” the Air Marshal informed. 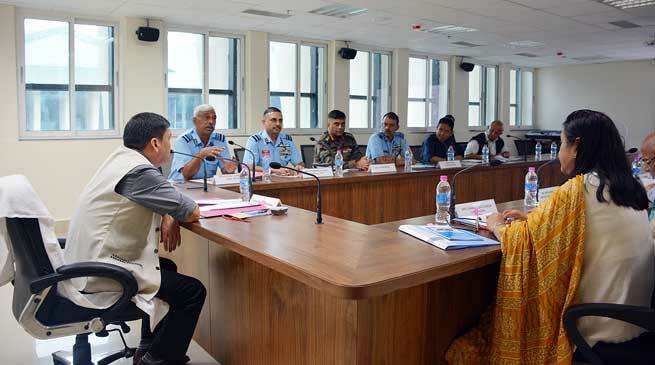 Underscoring the importance of all Advanced Landing Grounds (ALGs) in the state to be made fully functional, Chief Minister Pema Khandu directed the state Civil Aviation Secretary to personally intervene and coordinate with the Indian Air Force authorities to sort out all pending issues. He sought a detailed report from the Secretary by October 30 next. Speaking in a meeting with the Chief minist IAF Chief of Eastern Air Command, Air Marshal C Hari Kumar here this morning, Khandu categorically said discussions should be result-oriented and not just a beginning for another round of discussion. “We had several meetings with the Indian Air Force (IAF) authorities regarding the ALGs in the past but few issues are still unresolved. We need to move ahead with concrete decisions so that all the ALGs are made functional for regular use as soon as possible,” he said. Seven ALGs in Arunachal Pradesh were handed over to the IAF for making them functional. Of these five have been completed, which are at Ziro, Aalo, Pasighat, Mechuka and Walong. The other two – one at Tuting is scheduled to be completed by December this year and the other at Tawang by April 2017. However, certain issues like encroachment and constructions around few of these ALGs remain a security concern that have to be resolved before fully operationalizing them. The Chief Minister admitted these concerns raised by IAF that cannot be compromised and called upon all stakeholders, particularly the civil aviation department and local administrations to create awareness amongst the people and convince them to abide by the pre-conditions that would come with the much needed air-connectivity. He sought special attention of the state government officials on the two ALGs – Ziro and Aalo – that have major issues of air safety and air-space, specifically for use of fixed-wing aircrafts, as raised by IAF due to presence of civilian population in the vicinity of landing strips. Chief Secretary Shakuntala D Gamlin observed that confidence of the local populace, who have emotional and historical attachments with their habitations, has to be won and an amicable solution evolved in consensus with them. Meanwhile, participating in the discussion Pasighat MLA Kaling Moyong requested the IAF to keep at least 50% reservation for employment of local youths for manning these ALGs. To which Air Vice Marshal M Singh responded that IAF is open to employ local youths as much as possible. He said recruitment rallies are being conducted specifically for locals of Arunachal Pradesh. “We are more than willing to have as many youths of Arunachal Pradesh as possible in the IAF,” the Air Vice Marshal added. Parliamentary Secretary and local MLA of Mechuka, Pasang D Sona, IAF Group Captain S Arunachalam, Col N Mukerjee and top state government officials also attended the discussion.